Pupils carried out extensive research into the area and into the challenges and benefits that housebuilding brings to a community, before coming up with a wide variety of names. Following a tough judging process, Class 5AH won the challenge, naming the housebuilder’s site, on Worcester Road, Pear Tree Walk, in reference to the area’s link to the fruit, and were delighted to see the new signage when Bovis Homes representatives visited the school. Class teacher, Mr Hirons, said 5AH could now not wait to watch the development take shape over the road from the school. He said: "Naming a new housing development is not an opportunity that comes up very often, so when the chance arose, the class were very keen to be involved." One of his pupils, Jered, added: "The class cheered as we found out that our name was chosen. It was fun to come up with all of those names and it was very exciting to win the competition." The whole school was included in the competition and each class sent acting headteacher Stephen Booth a shortlist of names. Mr Booth said: “We were so impressed with the names our pupils came up with and want to thank Bovis Homes for encouraging them to get so involved in this project. “The children thoroughly involved themselves in the naming process, even going away to do their independent research on pear trees and the history of Drakes Broughton and Pershore. “Many of them travel past the site on their way to and from school and we can see it from our playing fields. “They are so interested in seeing it develop and to know they actively came up with the name, which is now proudly placed on signage at the development with our school’s name on it. Bovis Homes colleagues involved in the site were the judges of the competition, picking the Year 5 class as the winners, and the new signage is now proudly on display. 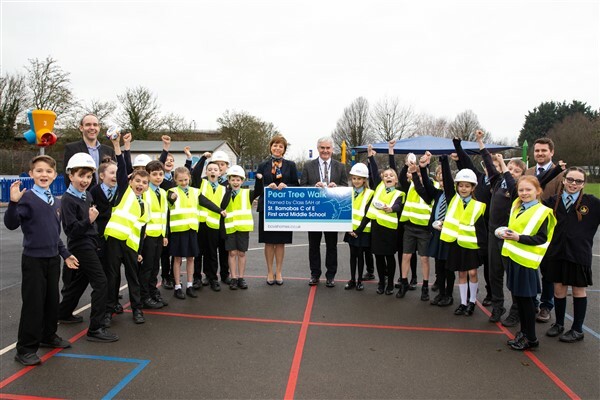 Paul Bennison, regional marketing manager at Bovis Homes, said: “It was really lovely to meet the children and to know they can watch our development being built from the school. “There were really high-quality entries to the competition and we believe Pear Tree Walk is an engaging name that paints a lovely image of what the location will become. A huge well done to class 5AH." Interested buyers can reserve from Saturday 9th February when the sales centre launches. To find out more about the Pear Tree Walk location in Drakes Broughton, visit www.bovishomes.co.uk.